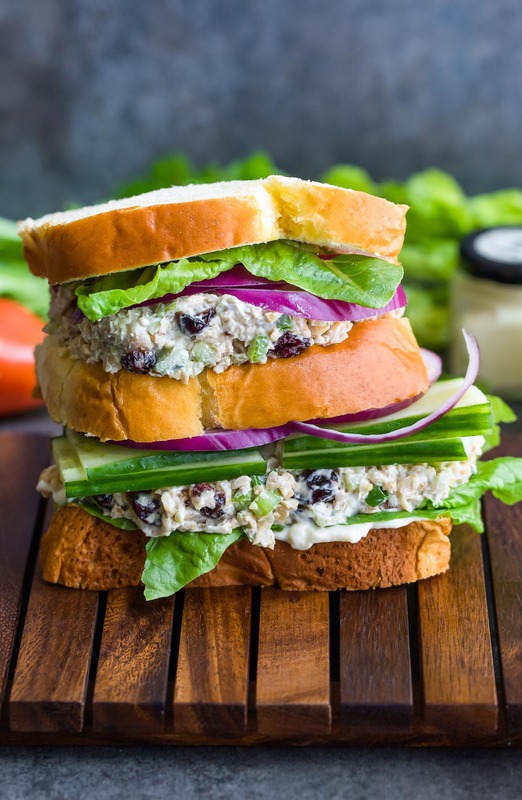 This Cranberry Walnut Chickpea Salad Sandwich makes a perfect make-ahead lunch for work or school. Meal prep FTW! If I take my B12 with a shot of coffee does that supercharge it? Well, not really… I could use some serious energy right about now! This mama is tired with a capital T-I-R-E-D! Needless to say, these days I’m all about the caffeine. And chickpeas. Though not usually together! (Seriously if you see me touting some sort of chickpea coffee situation on the blog you have my permission to Baker Act me!) I am totally convinced leaning out my eats with chickpeas in place of meat is a guaranteed energy boost. Today’s chickpea faceplant is in the form of the most legendary cranberry walnut chickpea salad sandwich! 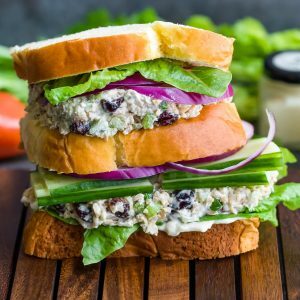 The recipe makes enough mashed chickpea salad goodness to make 3-4 scrumptious sandwiches, and it keeps for a few days in the fridge, meaning you can make these epic sammies in a matter of minutes! This crunchy cranberry chickpea salad is gloriously vegetarian with an easy peasy swap to make it vegan. Simply grab your favorite vegan mayo and you’re good to go! It’s also dairy-free and gluten-free and packed to the brim with all things veggie. To keep things GF, choose a gluten-free bread or bun or serve the mashed chickpeas over a bed of greens with your favorite dressing! 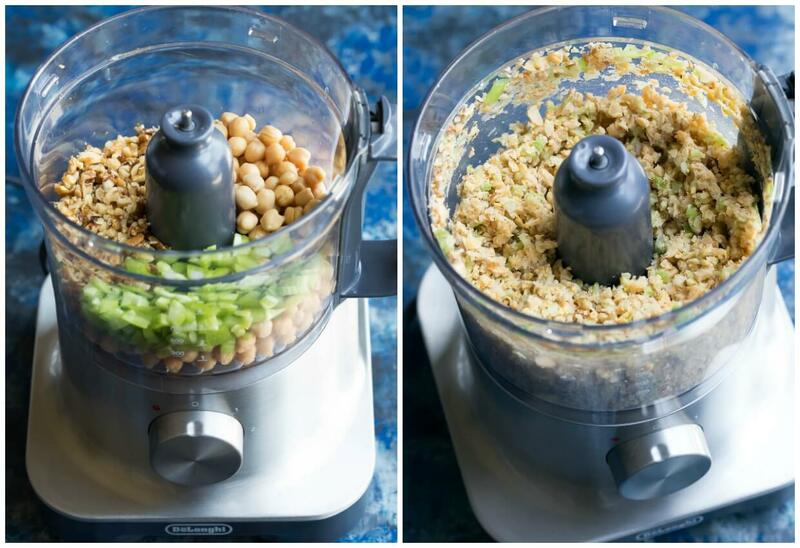 Drain and rinse your chickpeas and add them too a food processor along with your chopped walnuts and celery. Pulse/blend until texture appears flaked, almost like tuna salad. I use both a potato masher and follow up with a fork to make sure every chickpea is deliciously smashed. No food processor? You can also mash the chickpeas by hand with a potato masher and a fork. Transfer mixture to a large bowl and add dried cranberries, mayo, dijon mustard, yellow mustard, dill, salt, and pepper. Stir well to coat. Feel free to adjust any ingredients to taste by adding extras of your favorites! 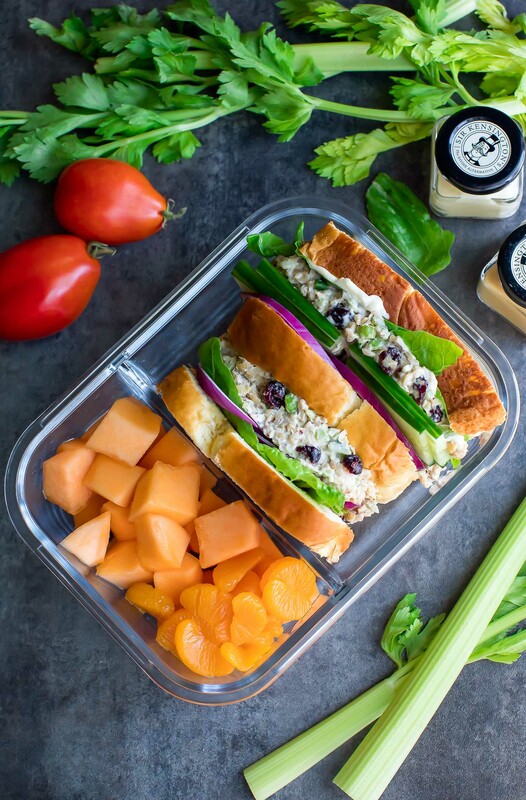 Pile high on bread with all your sandwich fixings and sandwich spread of your choosing, or enjoy as a wrap, with crackers, on a salad, or simply dive into the bowl spoon-first - anything goes! optional extra: Feel free to add some minced red onion in the salad if you're a fan! You can replace some of the green onion with it or use it in place if preferred. If you'd rather serve it sliced on top of your sandwich, simply skip adding it to the chickpea mixture. Nutrition Facts below estimated for the chickpea salad only using an online recipe nutrition calculator. Adjust as needed based on choice of bread and extras and enjoy! If you get a chance to whip up your own cranberry walnut chickpea salad sandwich, let me know! Leave some love in the comment form below or tag your photos with @peasandcrayons on Instagram so I can happy dance over your creation! Looking to mix things up? 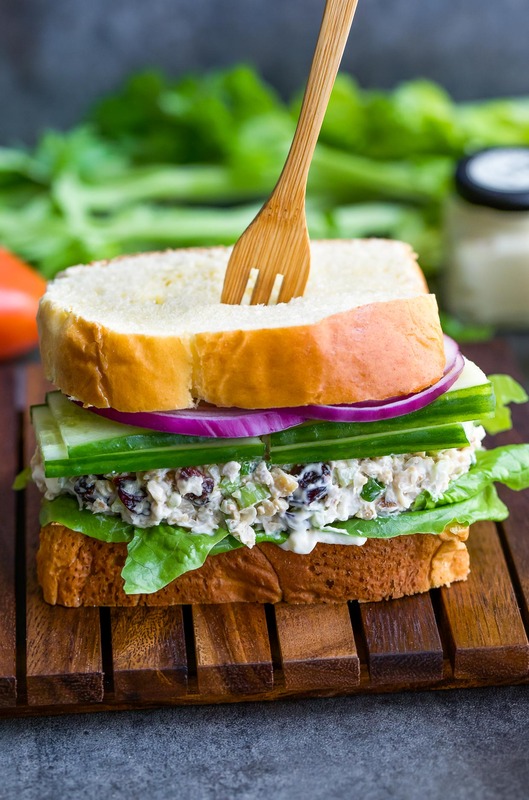 Check out all the different varieties of chickpea salad sandwiches you can make! The possibilities are endless. And delicious. So, so delicious. WHERE CAN I FIND THAT LUNCHBOX?! My handy dandy divided glass lunchbox is from IdealPrep and available in single packs and multi-packs on Amazon. I have the large and already use it so much that I want the 3-pk next! The lid seals great and is really sturdy, much better than other ones I’ve used in the past! Thank you for the recipe! Am in love with chickpeas now! This is so good. Tried the garden veggie chickpea salad sandwich and am hooked. This is an AMAZING recipe. So tasty. So fast and so simple. LOVE IT!!! 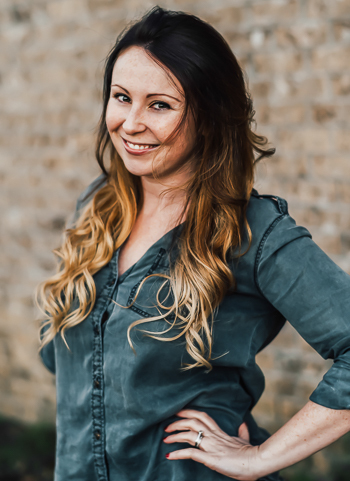 Super stoked you enjoyed it Stephanie! Thank you! 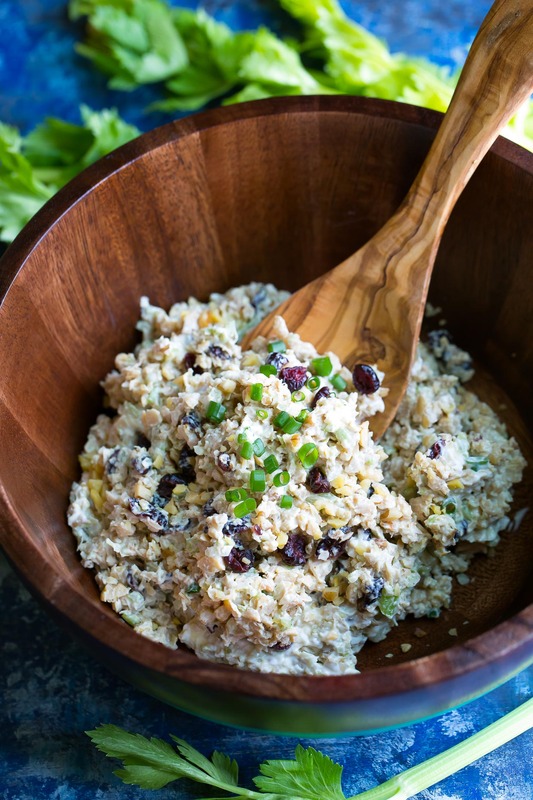 This looks like chicken salad perfection! I can’t wait to make it! Minus the chicken! 😉 Love it so! Such a great way to take lunch up a notch!! Love the crunch and the satisfying flavours!